How would you like to spend a whole day dedicated to nurturing your entire self? All of this in a tranquil location tucked away in a leafy southern suburb of Perth. Our women’s only yoga retreat day could be exactly what you need! Come and join like minded ladies for a rejuvenating day of yoga. These two dedicated yogis have been friends and yoga teachers for over 15 years. They love coming together to share their collective experience with you. The pace is gentle with options given for all levels so no yoga experience is needed. This includes anyone who is injured, a little older or recovering from chronic illness. We guarantee you will leave feeling more relaxed than when you arrived. 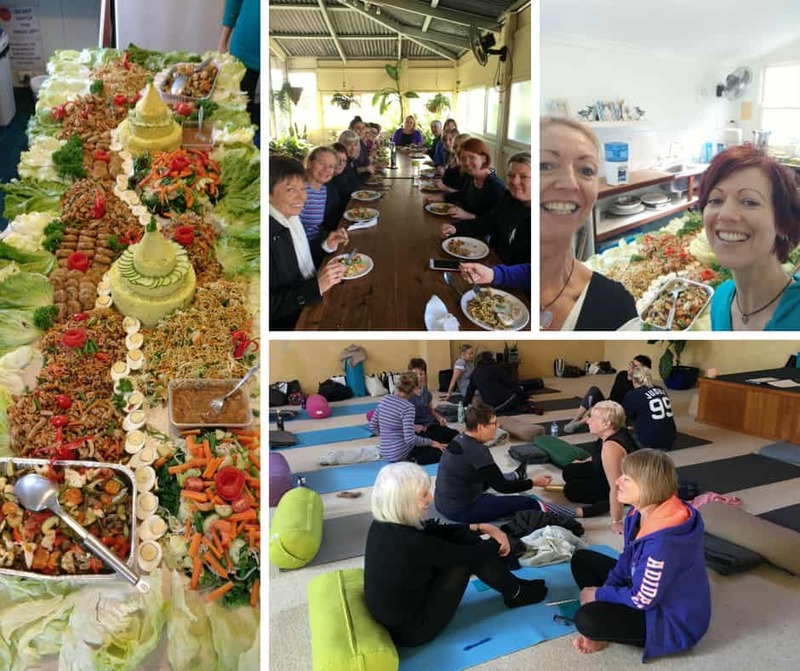 The yoga retreat day includes gentle yoga, pranayama (breathing techniques), guided meditations, walking mindfulness meditation & time for silent reflection. We also welcome guest teacher Michelle Fox who will take you on a sound journey with live music to accompany a restorative yoga session. Fully catered with a nutritious morning tea and an amazing vegetarian food mandala for lunch (see pictures!). You’ll also receive a goodie bag to take away with you. Held at the historic and picturesque grounds of the Sivananda Ashram in suburban Fremantle. or Bettina 0438 800 499 info@yoga2fitness.com.au directly if you have any queries. Why Take A Yoga Retreat?